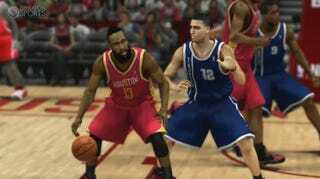 After James Harden (pictured via Operation Sports, above) was traded to the Houston Rockets in a weekend blockbuster deal, NBA fans were keen to see how he'd play with his new team in NBA 2K13. Trouble is, this morning's regular roster update didn't have Harden on the Rockets. Nor did it look a thing like the current picture of the league as it prepares to tip off this evening. Well, there's a reason for that. "The wrong NBA2K13 roster update was accidentally posted by dev last night, is an older file," tweeted Ronnie Singh, the game's social media guru. "A new one will be posted tonight. Sorry." UPDATE: 2K Sports says Harden did make the file that went out, but it was still the wrong roster, and the correct one still is being uploaded tonight.